IGetWeb Review 2019: Is IGetWeb a Good Hosting? iGetWeb is a website design company that also offers web hosting solutions. It is based in Bangkok, Thailand. Established in 2003, the company offers an array of internet solutions, including domain name services, web design, website services, and email solutions. The web design company, iGetWeb is one of the most popular Thai-based web hosts, responsible for hosting over 4.5 million websites. Established in 2003, the company focuses on providing hosting solutions to all types of websites from its customers across the globe, including Thailand, Vietnam, Laos, the United States, and Switzerland. The iGetWeb website is poorly designed, and despite a notable presence in several countries, the website is only available in Thai. iGetWeb servers operate on Linux OS. Its servers are monitored 24/7 to ensure that the system keeps running round the clock and that emerging issues are addressed promptly and effectively. iGetWeb hosting solutions are listed in four plans: S, M, L, and XL. S is the vendor’s starter package and comes with 400MB storage space, 20 email accounts, and 40GB data transfer while the premium package, XL, comes with more advanced resources to handle large websites. It includes 5GB storage space, unlimited email addresses, and 500GB data transfer. iGetWeb performs automatic weekly backups for all its hosting plans. The backup plan includes easy file retrieval in case of a disaster. One of the additional services that this vendor offers is Business email hosting. This hosting solution is ideal for organizations or individuals who require extra email services without the need for email hosting disk space. 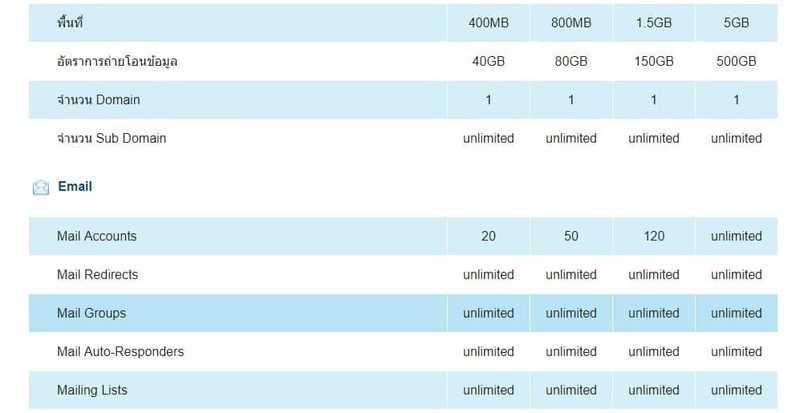 The email packages come with unlimited accounts, 100MB to 2GB email space, and unlimited data transfer. The iGetWeb website is poorly designed for hosting customers, as the vendor gives preference to its web design business. You’d be forgiven for thinking that its hosting business is an afterthought. iGetWeb offers cheap web hosting solutions, especially for customers who commit to one year or more of web hosting. The prices are listed in Thai baht and don’t include a free trial or a money-back guarantee. This company offers an uptime guarantee of 99.94% which is slightly lower than the 99.99%+ that many other vendors offer. Webmasters can contact the iGetWeb support team via telephone or email, but not live chat or ticketing system. For more technical issues, clients in Thailand can visit its offices which are open from 9:00 a.m. to 6:00 p.m. ICT daily. The vendor’s customer support is not available 24/7 and my attempts to contact them about their hosting solutions were unsuccessful. While the hosting provider has included numerous links to hosting tutorials and manuals, the URLs suggest that they lead to another website, but, perhaps more importantly, all of them are dead links. While iGetWeb has remarkably grown its hosting customer base in Thailand, the company’s future as a sought-after hosting vendor might depend on how much emphasis it puts into creating an easy to navigate website for its hosting customers. The dead knowledge base links will be especially frustrating for its novice webmasters, and its unresponsive support team is bound to keep many potential customers away. Wondering how IGetWeb stacks up against other Web Hosting companies? Enter any other Web Hosting company and we will give you a side-by-side comparison.